You know when people say “it’s a small world?” I really learned the true meaning of that this post. I came 6,000 miles from home and yet – well, you’ll see. Check it out below! I last left off after my weekend of island hiking, but the Saturday evening after Lamma Island, we got fancy. That evening, my friend Jen’s boyfriend came to Hong Kong because he would be working for two months in the Singapore branch of Deutsche Bank. Jen had organized a really nice dinner reservation at this restaurant in Tsim Sha Tsui called Peking Garden at 9, and a group of eight of us went. One of our friends, who grew up north of Beijing before moving to Canada when he was 11, did the majority of the ordering (along with a little help from my Frommer’s Hong Kong book) for the whole group. I have to say, all that we ordered was delicious; we had house made noodles with peanut satay sauce, mushrooms, prawns in rice wine, three kinds of dumplings, mutton and noodles (I loved mutton at this point, by the way), steamed vegetables, marinated beef, thinly sliced pork in honey sauce with lotus that you put into little flat folded pieces of dough, and these incredibly fatty pieces of pork cooked in a sweet sauce inside little pots (the actual name may be slow braised pork in a clay pot, but I can’t be totally sure), the pork pieces were quite large but meant to be eaten in one huge bite (very attractive to watch, I can tell you) and were indescribably tasty (because they were so unhealthy probably). 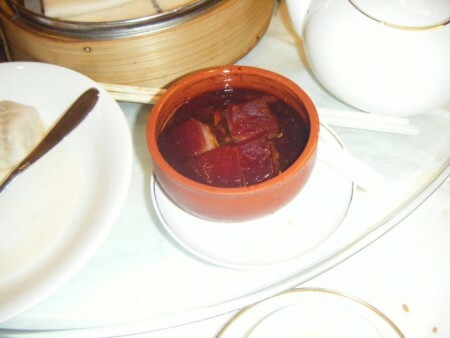 The braised pork in a clay pot. One of the tastiest things I’ve ever eaten. The pork in honey sauce to place in pieces of dough. The whole meal was just really fabulous, and after dinner we rode the Star Ferry across the harbor to Central and the majority of us went to LKF again and partied in a club I’d never been to before called Pi, that was really fun. Here’s the craziest part, in the elevator in Pi I ran into a guy that I’d gone to elementary school with back in the US! I kid you not, Nick and I rode down on the same elevator, I heard someone say, “Blah, blah, blah, Nick” – I glanced at him, he looked at me, and at the same time, the recognition dawned on us. Turns out he was studying at Hong Kong University across town (on exchange from Syracuse University) the same semester I was at HKUST. What are the odds that we’d be in the same elevator at the same time halfway around the world? I was totally gobsmacked, and still am about that chance meeting to this day. I mean, I hadn’t seen the guy since high school graduation and this happened! What a tiny, tiny world we live in, huh? I didn’t get a picture, but I should have. 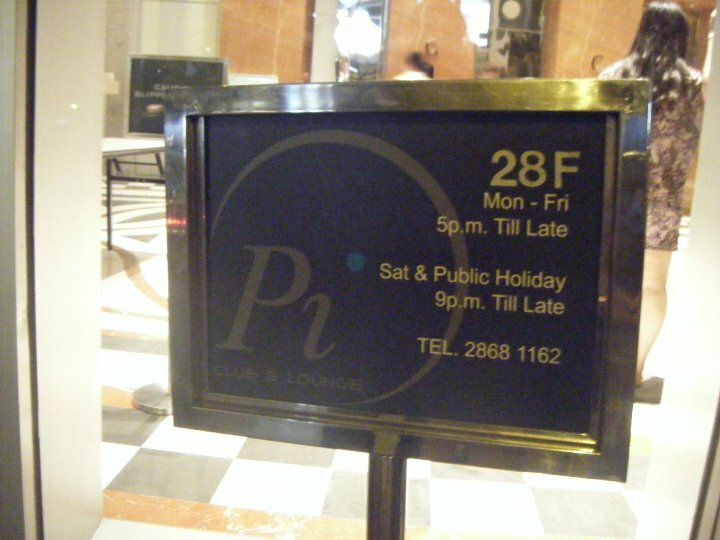 Pi’s entrance sign in LKF. Good club for sure. Sunday was a little more of a recovery day from all the hot and sunny hiking I’d been doing all weekend. Instead of going outside on Sunday, I went on my own to explore a mall in Tai Koo (one of the many MTR stops) called City Plaza that I hadn’t visited before. It was a pretty decent mall with a cinema, a skating rink, and a big Mother’s Day-themed promotion going on – there was even a Ruby Tuesday’s I was surprised to say. So I had a more relaxed afternoon, and that evening I went out to dinner in Soho with a graduate student I’d met who was studying finance at HKUST. We went to a Nepalese restaurant with excellent food – it was my first introduction to Nepalese cooking, but the man I was out with is from India and said it was quite similar to some of the Indian dishes he’d grown up with. We ended up ordering a barbecued lamb dish, chicken in curry sauce, saffron rice, and dumplings stuffed with lamb as an appetizer. Delicious food and so much that we couldn’t finish it all. After dinner, I introduced him to a frozen yogurt place my roommate Katrin had shown me just a few streets away, and after that we stopped into one of the bars in LKF for a drink before heading home on one of the last MTRs of the night. 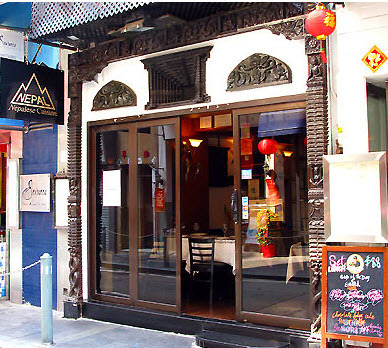 Literally the name of the Nepalese restaurant I had dinner at was “Nepal Restaurant.” Highly original, I agree. That was my week in a nutshell. My next posts will be quite an update, prepare yourselves, because it will be after my return from my last tour of another Asian country (for this study abroad blog, at least) – Taiwan! Get excited everyone, because you’re gonna love it! The adventures got even more outlandish than I could have ever imagined. 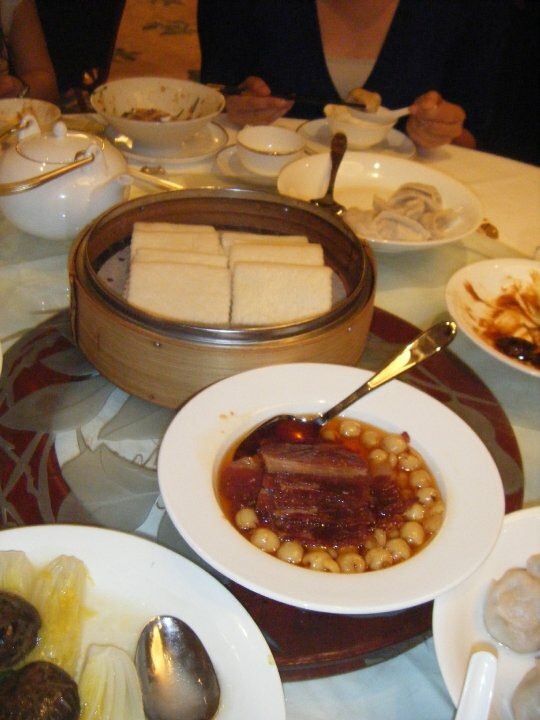 This entry was posted in Asia, Hong Kong and tagged Asia, Home, Hong Kong, Jade Garden, LKF, Nepal, Pi, Pork, Shopping, Travels on April 30, 2014 by Paige N..